Dr. John Graver 12401 US Route 36, Marysville, Ohio 43040 Union county. 210 acres. 12 horses. 2 mares private farm. W. R. & E. C. Komlo, 12298 Chamberlin Road, Aurora, Ohio 44202. Portage County. 70 Acres. Edward Komlo, Manager. Phone:(330) 562-7063. Private Farm. Dr. Tod Beckett, 39 Grandview Drive, Dublin, Ohio 43017. Franklin County. 7 horses. 5 mares. Dr. Tod Beckett, manager. Steve DeMaiolo, 8166 N. Market St. Ste. N, Boardman, Ohio 44512. 14 mares-Braun’n Gold, Candy’s Girl, Cargo Jet, Countess Scala, EmNEmmy, Gold Ink, Impatient Lady, Jensens Score, Kolinsky, Last Fever, Lilah, Magnificent Miss, Propriety, Smart Stride. Timothy E. Hamm, 11990 Diehl Road, North Jackson, Ohio 44451. Mahoning County. 20 Acres. 15 mares-Awesome Eve, Come Sunday, Cruise Liner, Delitefully, Finallusion, Mini Mom, Mini Mostest, Nothin But A Thing, Oh So Easy, Personally Yours, Radiant Sky +. Phone: (330) 393-0100. Fax: 330-393-0280. e-mail: tehracing@aol.com Visiting Hours: By Appointment. Florida Training Facilities. Horses For Sale. Private Farm. Kevin & Holly Chandler, 11425 Kionsville Palestine Road, Mt. Sterling, Ohio 43143. Madison County. 50 Acres. 22 horses. 10 mares. Holly Chandler, Manager. 2986 Columbia Road. Lebanon, Ohio 45036. Warren County. 1811 Bears Den Road, Youngstown, Ohio 44511 Mahoning County. 7 horses. Ed & Angie Crothers, 4228 Unity Road, West Union, Ohio 45693. Adams County. 30 Acres. 60 horses. Manager: Ed Crothers. Phone: (937) 544-1463. Fax: (937) 544-1499. e-mail: ww5081@dragonbbs.com. Stallion: Prayer on a Wing. Visiting Hours: 9-5 Mon.-Sat. Horses Boarded. Horses for Sale. Commercial Farm. Vicki L. Zunic, VMD. 4480 Miller Road, Springfield, Ohio 45502. Clark County. Harold L. Brown, DVM. 2731 S. River Road, Cedarville, Ohio 45314. Greene County. Harold Brown, manager. 20 Acres. 10 horses. 4 Mares (House Divided, Jessies Buckwheat, Scarlet Clay) Phone (937) 767-2050. e-mail:harold.brown1944@gmail.com Visiting Hours: By Appointment. Horses Boarded. Horses for Sale. Private Farm. Catherine Jacob, 7230 Cincinnati-Brookville Road, Okeana, Ohio 45053. Butler County. 75 Acres. 10 horses. 3 Mares-Honey Bee Mine, Wild Cat Thunder, Mongoose. Phone & Fax: (513) 738-2746.
e-mail: cathbjacob5@gmail.com Visiting Hours: By Appointment. Horses Boarded. Complete foaling facility. Horses For Sale. Commercial Farm. 925 Darby Creek Drive, Galloway, Ohio 43119. Franklin County. 4300 Acres. Phone:(614) 853-0645. Fax: 614-853-1831. Commercial Farm. 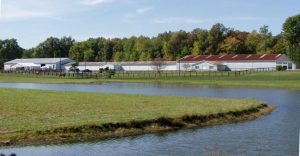 Kentucky-Darby Dan Farm 3225 Old Frankfort Pike, Lexington, KY 40510 (859) 254-0424. Raymond E. Donald, V-451 County Road 4, Liberty Center, Ohio 43532. Henry County. Mares-Picture of Mom, Adella, Light the Candles, Sharp Fact. Double D Farm Corp., 8088 Chatham Road, Medina, Ohio 44256. Medina County. 110 Acres. 25 Mares. Jevon Crumley, Manager. Stallions: Baronial, King Tutta, Superestrella, Terrific Storm. Phone: 216-513-0334. Website: Doubledfarm.com. Visiting Hours: 9:00AM – 4:00 PM Mon. thru Sat. Call for appointment. Horses For Sale. Commercial Farm. Mary Crawford, 9011 Booth Road, Mentor, Ohio 44060 Lake County. 100 acres. 10 horses. 4 mares. 3 mares: Slide Along, Party Aly, Quiet Ways, Slide’s Choice. Phone: 440-256-3940 Fax: 440-256-3909. Tom McCann, 2911 Sutton Road, Yellow Springs, Ohio 45387. 157 Acres. 14 horses. 7 Mares- Certainly a Star, Puunky’s Ghost, Nenies House. (937) 376-2597. Visiting Hours: By Appointment. Private Farm. Cara Patton 996 Sicily Road, Mt. Orab, Ohio 45154. Highland County. 32 Acres. Cara Patton, Manager. Facilities; Round Pen. Phone: (513) 317-5723. Visiting Hours: Appointment. Horses Boarded. Horses For Sale. Commercial Farm. Goodwood Farm has 3 opening’s for 2017 foaling season. We are in Mt. Orab about 45 minutes East of Belterra Park. Poplar Creek is a convenient 20 minutes from us. Alexander (ABC) Brendel, PO Box 517, Canal Fulton, Ohio 44614. Stark County. 78 Acres. 5 Mares. Phone/Fax: (330) 854-4290. Manager, Christine Cottrell (330) 431-9714. Training Facilities: Indoor Jog track, Outdoor Gallop Track, Indoor hot walker. Visiting Hours: By Appointment. Stalls for Rent. Breaking/Training/Layup/Broodmare & Foal Boarding. Horses For Sale. Commercial Farm. Harold & Lloyd Acres, 2914 State Route 132, New Richmond, Ohio 45157. Clermont County. 10 acres. 5 horses. 4 Mares: Peggy’s Ruby, Sybles Angel, Princess Christine, Far East. Harold Acres & Lloyd Acres managers. Visiting Hours: by request. Phone: (513) 226-6725. Timothy Heinrichs MD, 6412 Erastus Durbin Road, Celina, Ohio 45822. Mercer County. 40 Acres. 10 horses. 5 Mares-The Tax Lady, Ellej, Moonlight Doctor, Ruby’s Necklace, Brown Recluse. Phone: (419) 942-1533. Fax (419) 763-5305. Dennis & Susan Heebink, 11735 Flowers Road, Rockbridge, Ohio 43149. Sales preparation-consignment. layup/rehabilitation. Phone: (740) 380-2752. Private Farm. Bruce & Nancy Hudson, 1631 New Love Road, So. Charleston, Ohio 45368. Clark County. 20 acres. 18 horses. 5 mares. Lucy Diver, Fluffy on the Inside, Saphire Bluestone, Rose, Maggs. Phone: Bus: (937) 408-0107. Holly Donovan 17415 Jug Street, Burton, Ohio 44021. Geauga County. 30 acres. 20 horses. 5 mares-Stellar Attraction, Sashi, Imitate. Stallion: Sweep the Wire. Shelly Radosevich & Jake Radosevich, 12640 Mayfield Road, Chardon, Ohio 44024 Geuaga County. 58 acres. 40 horses. 7 mares-Big Ma Moo, Aspetuek Hill, Blue As the Nile, Whyus, Elsie’s Image, My Girl Cassie, Cassie is the Boss. e-mail: langsem1@aol.com. Visiting Hours: Appointment. Horses Boarded. Horses For Sale. Commercial Farm. Dr. Randall Blevins, 5795 Shilling Road, Louisville, Ohio 44641. Stark County. 75 Acres. 12 horses. 4 Mares-Eye Slew the City, Eyes of Berthold, Holy Bullseye, Call Me M Tricky. Cheryl Broad, Manager. Phone:(330) 875-4377. Barn: (330) 875-0280. Fax: (330) 499 3744. Horses Boarded. Horses for Sale. e-mail: 3308752300@nci2000.net Visiting Hours: 8-5 Monday thru Thursday. Commercial Farm. Rick & Shelly Terrell, 9382 Alkire Road, Grove City, Ohio 43123. 8 acres. 6 horses. 3 mares-Compliment Tree, Magnific Maddie, Good Hope Girl. Dr. George Sikora & Dr. John Bryk. 732 State Route 89, Polk, Ohio 44866. Ashland County. 300 acres. 50 horses. 30 mares-Alpha Heat, Apple Annie, Bossy Girl, Chic Cat, Cowgirl Wisdom, Dubaian Duel, Echt Englaterra, Girlish Figure, KissThe Breeze, Lemonesque Lover, Milwaukee Queen, Perfect Solution, Preservation Hall, Regal Point, SkyCap, The Lady Waffles. 3 stallions-Awesome Patriot, Cowtown Cat, Mobil . Visiting hours by appointment. Horses for Sale. (419) 945-2424. fax: 419-945-2726 e-mail:MTFoffice@yahoo.com. website: www.mapletontbfarm.com. Janet Reeder 318 Grandin Road, Maineville, Ohio 45039. Warren County. 17 acres. 7 mares. Phone: 513-683-3482. Fax: 513-241-2095. Robert Gorham, 9939 West Fork Road, Georgetown, Ohio 45121. Michael & Terri Meyers, 2071 CR 26, Helena, Ohio 43435, Sandusky County. 15 acres. 3 Mares-PD’s Aventure, Whatadventure, Canvas Court. Scott & Carol Barker, 9754 Bellbrook Road, Waynesville, Ohio 45068. Bruce Thomas, 5197 Chilicothe Road, Chagrin Falls, Ohio 44022. Geauga County. 3505 Mt. Tabor Road, West Liberty, Ohio 43357. Champaign County. 140 acres. 10 horses. 5 mares-Sweet Dish, Proud Phantom, Michunique. Jessie Nichols, manager. Phone: 937-465-5326 e-mail: jesslou@hotmail.com. Anne & Eugene Novy, 8574 Peck Road, Shalersville Twns., Ohio 44266. Portage county. 7 mares- Too Many, Rowdy Haste, One More Time, Our Miss Polly, Pricey Tab, Tea Party Hearty, Recalculator. Cheryl Novy, manager. Phone: 330-297-0341. Gary & Jennifer Holland, 2375 Anderson Road, Xenia, Ohio 45385. Greene County. 60 Acres. 6 horses. 2 Mares-Welcome to Shobiz, Maggie’s Pleasure. Gary Holland, Manager. Phone: 937-376-9930. Fax: 937-376-9930.
e-mail: Jholl9930@aol.com Visiting hours by appointment. Horses Boarded. Horses for Sale. Private Farm. Robin Murphy. 3400 Macedonia Road, Bethel, Ohio 45106. Clermont County. Full service boarding, breeding, foaling, sales prep. Kimberly Blakeslee, 5765 Fairfield School Road, Columbiana, Ohio 44408. 6 acres. 2 horses. 2 mares-Sarah’s Prize, Paradise Beach. R.C. Cline, 8920 Nioga-Toops Road, Orient, Ohio 43146. Madison County. 30 Acres. Visiting Hours: By Appointment. Horses Boarded. Horses for Sale. Commercial Farm. 2017 S. Elyria Road, Wooster, Ohio 44691. Brian Raimonde, manager. 330-621-6531. David Bryan, 15896 St. Rt. 613, Paulding, Ohio 45879. Paulding County. 10 acres. Fred & Kris Nemann, 1526 Bethel-New Richmond Road, New Richmond, Ohio 45157. Clermont County. 53 acres. 50+ horses. 15 mares. Kris Nemann, manager. Rocking Valley Training Center, 14500 NW 160th Avenue, Williston, Florida 32696 (352) 528-5757. Marion county. 77 acres. 60 horses. 25 mares. Stallions: Acts Like A King, Part the Waters. Lowell F. Allen, PO Box 207, 7952 St. Rt. 125, Russellville, Ohio 45168. Brown County. 109 Acres. 21 horses. 15 mares-Check the Math, Keen Scent, Real Distinctive, My Celtic Star, Kid Rockette, Spectaculous, Dream Manager, Ann, Stamp Queen, Lady Symphony, Without A Sound, Perpetuity, Apple of My Eye, Insert Name Here, Nesfield. Lowell Allen, Manager. Visiting Hours: 9AM-4PM Mon.-Fri. Horses For Sale. Private Farm. Debra Schaber, 12583 Roller Coaster Road, Lisbon, Ohio 44432. Columbiana County. 20 acres. 10 horses. 2 mares-Done Goose, West Point Star. R. D. Fields, P.O. Box 424, Chillicothe, Ohio 45601, Ross County. 50 Acres. Manager: Steve Shoemaker. 3 Mares: Scioto Falls, Scioto Jo, Scioto Seacat, Rio Branco. Phone:(740) 772-5253.e-mail:fields@horizonview.net. Visiting Hours: by Appointment Only. Horses Boarded. Horses of all ages for sale. Private Farm. Lawrence W. Friel Jr., 8235 Marcy Road N.W., Lancaster, Ohio 43130. Fairfield County. 200 Acres. 4 horses; 6 Mares-The War Department, For Your Info Marcy, No Return Nancy, Queen of Fostoria, Molly Pritcherd, Marcy’s Mill. Lawrence W. Friel Jr., Manager. Training Facilities: Dirt & Turf Tracks & Gallops. Turf & 2 Dirt Training Tracks. Phone:(614) 837-8467. Fax: (614) 837-8468 e-mail: marcyroad@msn.com. Horses for Sale. Private Farm. Bobby & Colleen McMichael, 1917 Cuba Rd., Wilmington, Ohio 45177. Clinton County. 100 Acres, 50 horses. 1 Mare-Shaza Runaway Star. Dr. Paul Gutheil, 6721 O’Harra Road. Galloway, Ohio 43119. Franklin County. 240 Acres. 6 Mares. Brooke A. Adkins, Manager. Training Facilities: 1/4 Mile Track. Phone:(614) 878-7285. Visiting Hours: Appointment. Horses Boarded. Horses For Sale. Private Farm.